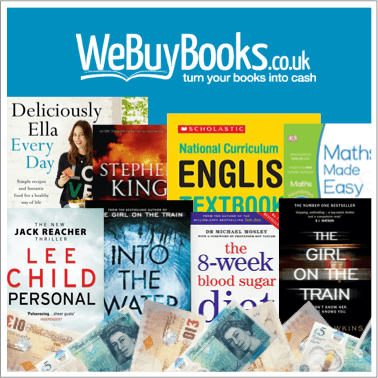 Sell Stuff Online and Make Some Extra Dosh at WeBuyBooks! Sell stuff online and make some extra dosh! Got loads of stuff but not loads of space? Then sell stuff online with We Buy Books! If your bookshelf has more books stuffed in it than the local library, it might be time to cut down your collection. Everyone loves a good book, right? It’s ace to curl up on the sofa with a book and a brew. There’s no better way to relax than to kick back, open a book and tear through the pages. Plus, books aren’t just good for sparking your imagination, as they can be educational too. No doubt you’ll have a tower of textbooks at home if you’re a student. Textbooks can cost a bomb, so we can see why you might be reluctant to get rid of them. Get shot of your textbooks (we take CD’s, DVD’s and Games too!) and sell stuff online with us – you’ll earn some extra pennies the easy way. Get cash – fast when you sell stuff online! We’ll gladly take your old holiday reads, textbooks, cookbooks and novels off your hands. If your books are in decent condition, we’ll give you a decent chunk of cash for them. As long as your books aren’t dropping off the binder or missing pages, we’ll want them. If you want to be really sure that your books are in a suitable condition then take a peek at our handy little guide right here. For full list please click here. Don’t be fooled by the name – we buy more than book! But, while you’re at it on a mad cleaning spree, hunt out all the DVDs and CDs that never get any playtime. We’ll buy them or any unwanted video games too. Maybe you have the Silent Hill game but you never play it because it scares you witless. If that’s the case, send it to us. And, send us any other games that are simply gathering dust on your shelf. We buy more than just books, so sell stuff online with us. Shift your stuff fast! 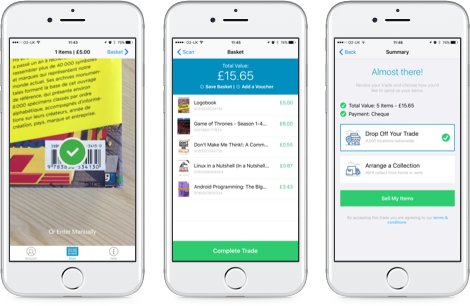 Selling books for cash is ten times easier with our mobile app. Our app will turn your mobile camera into a scanning device, so you’ll be able to scan and sell books on the go. 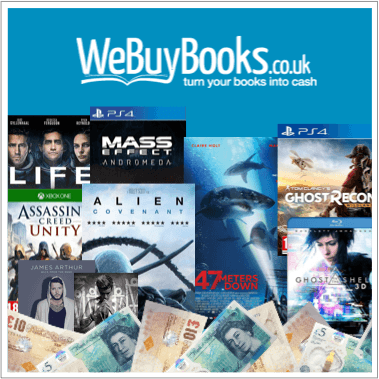 Plus, you can now Sell Used Games, Sell DVDs and Recycle your old CDs as well as Sell Second Hand Books, Swap Books For Cash, Trade In Books, Selling Old Books, Sell DVDs for Cash and Sell Used School Books right here at WeBuyBooks. Fire your unwanted stuff our way and sell stuff online with We Buy Books today.